below are a few excerpts from the book by Dorchester resident James Pratt. 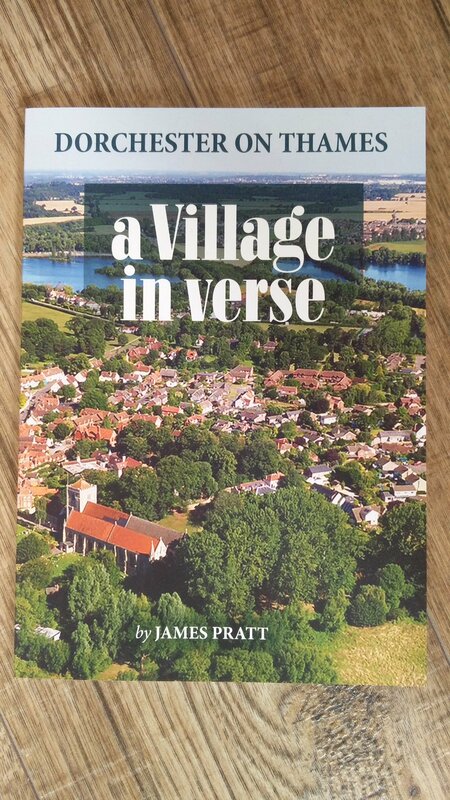 The recently published book is available from Lilys and the Museum for £7.50, and is full of Poetry based on (and inspired by) the people and history of our wonderful village, as well as the Thames that passes by it. the ice age finally receded, to all life a welcome surprise. but as mother nature worked her charms, this became our beloved Thames Valley. ground deposits still bear witness, for their history can also be traced. Our local group the Atrebates fortified sinodun hill, an outstanding planned local wonder. a single ditch and rampart gave safety once in its compound. an oppidum fort with dyke hills was constructed, nearby as desired. Alongside the Thames, and also the Thame, defended by a northern bank and ditch. A large iron age community used this site, and so life went on without a hitch. Yet finally again Dorcic moved, to its location still to this day. In the first century the romans arrived, for a while they ruled their way. well-engineered and constructed, ‘state of the art’ in its day. The majority of romans left Britain in the year 410, although some small groups stayed on. The locals regained all control; after all roman legions had gone. and the place he ministered to Dorcic locals, an impressive abbey now stands. and the past should not be forgottenm we all play a part in our way. watching history come and go. the world you’ve yet to know? to countries far and wide. or some other mystical place. met by a well loved face. that’s why you came this way? whether on foot, or bike, or car. at No 4 High Street, the memorial was next door. down, for you to look at here. we hoped they would not come to any harm. just before it blew, her saved the crew and boy, were they all glad. they formed the photo squadrom and things moved up a pace. they practiced manouvers, built pontoon bridges and were based at overy too! the yanks were having a boxing match people came from miles around. Because we helped, we had ring side seats, I could not believe what I did see! Joe Louis world champion right there in front of me! Copies of James’s book can be posted, please email any requests to tina@alexander-advertising.co.uk.